I've always been impressed with how the Tulalip Resort Casino has integrated the culture throughout the casino and resort. 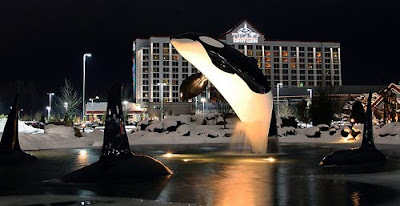 Starting with the huge Orca fountain in front of the casino to see Lushootseeed you see next to the English names of restaurants and other key rooms. Recently, Tulalip notched up their efforts. I've now seen several TV commercials for Tulalip in which they end by printing and saying the Lushootseed word for "fun" or "welcome". Pretty darn cool that millions of people around the Puget Sound are watching these commercials and now get to see and hear Lushootseed for the first time. Kudos to Tulalip! Now that I'm taking Lushootseed at the Duwamish Longhouse with Mike Evans, we'll see if I can understand more next time I pay a visit.